Chinese style, creamy sweet corn & shredded chicken soup. Water, Sweet Corn (17.5%) Cream (from Milk), chicken (4.5%) Potato, Corn Starch, Sugar, Salt, Natural Colour (Beta, Carotene). Contains Milk, may contain traces of crustaceans, Sesame, Peanut and Tree nuts. There is something wonderfully comforting about chicken soup. Warm, satisfying and healthy – or so say most grandmothers! 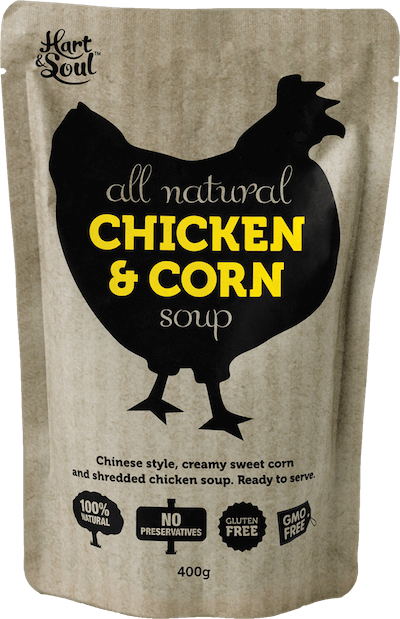 The supposed benefits of chicken soup’s medicinal properties have been passed down by word of mouth for centuries.